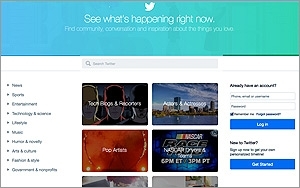 As part of an ongoing effort to engage newcomers and social novices, Twitter has revamped its homepage for people who are not signed-in to its service. The change will affect “many millions of people,” according to Gabor Cselle, a product manager at Twitter. Now, when those people visit Twitter.com, they will be presented with topics to explore, including Politics, Pop Artists and, of course, Cute Animals. Twitter is introducing the new Twitter.com on desktop to U.S. consumers first, with the intention of bringing it to international markets over time. Long criticized for flying over the heads’ of average users, Twitter has been taking steps to simplify its service and encourage users to stick around for longer durations. Earlier this month, for example, Twitter retired its #discover and activity tabs for all iOS and Android mobile users and moved trends to the search page. Trying to take the guesswork out of trend-spotting, Twitter is also added descriptions to trends -- and in some cases, more data about a trend and its trajectory. Counting on the stickiness of moving images, Twitter also recently acquired live-video platform Periscope, and began testing auto-play video ads among consumers with iPhones and other iOS-supported devices. Despite efforts to broaden its mass-market appeal, however, Twitter’s user growth continues to slow, according to a recent forecast from eMarketer. Last year, Twitter's U.S. user base grew 12.1% to reach about 48.4 million users -- while user growth should fall into the single digits this year, eMarketer estimated. By contrast, the number of U.S. Instagram users increased nearly 60% in 2014, bringing the social network’s domestic monthly user base to 64.2 million people, according to eMarketer. 1 comment about "Twitter Redesigns Homepage, Focuses On Topics". meghan gifford from asu, April 15, 2015 at 11:36 p.m. I think this is a very smart marketing decision for Twitter. Redesigning the homepage where people can click popular topics and see the feeds will only make the people who do not have twitters drawn to it more. I think it is a very good advertising idea as well. When people see that they have the option to look at a Twitter feed before creating a login is an excellent option for people. It will show people what they are missing and probably draw them in even more.